Is UHT Milk The Way Forward For The Health-Conscious Youth? Milk is the primary source of nutrition for the mammalian young. Milk has also been a source of food for humans and can also serve as a diet with sole purpose as complete food content with high nutritional value. In this age of adulteration and impurity, the need to maintain this nutritional value gains immense significance and this thought is gradually gaining pace amongst the marketers of the Ultra-high temperature or Ultra heat Treatment (UHT) milk across the world. ‘Slow and steady wins the race’ is the mantra for the manufacturers of UHT milk in comparison to mainstream consumption of commercially sterilized pouched milk. UHT milk has a shelf life of greater than 6 months without the use of preservatives or even being refrigerated. UHT milk has been largely successful in countries like France, Spain, Belgium, Italy, Portugal and Turkey among other countries. Pasteurized milk effectively eliminates the potential pathogenic microorganisms, but it is not sufficient to inactivate the thermostatic spores in milk. The commercially sterilized milk, which is subjected to heat of temperatures ranging in excess of 100 degree Celsius, sold by your door-step milkman is not perfectly sterilized milk, free from all microorganisms. However, such polypouched milk is unlikely to get spoiled during the time it is under storage facilities. The UHT milk is sterilized at temperatures exceeding 135 degree Celsius with holding time of about two to five seconds to destroy airborne microbes and packaged in to pre-sterilized containers like Tetra Brik pack. The UHT process compresses the time taken to sterilize the milk which in turn leads to higher quality product with relatively higher shelf life vis-Ã -vis commercially sterilized polypouch milk. Thus, the convenience of accessing milk directly from Tetra Brik pack at any time without any worry of the product’s shelf life and the benefits of UHT products for the health due to its efficient way of sterilization has led to some of the developed markets more savvy in preference for such high quality products which are also free of any type of preservatives. However, in spite of various health benefits, the high price of UFT milk, which is in the range of Rs.35 and Rs.40 a litre, still remains to be barrier of this specially treated food among regular consumers of milk. On the other hand, a large part of the uninformed Indian public relate such specialized milk packs as hazardous for health and more worth for commercial use rather than daily consumption use. UHT Also Serves the Ecological Way ! Officials have calculated that by reducing chiller capacity in supermarkets, convenience stores and corner shops, carbon emissions would be significantly reduced. The move is not against the domestic use of fridges; UHT milk, once opened, must be refrigerated. 1) Mother Dairy manufactures UHT milk in form of toned (with just 3% milk fat) and double toned milk (with just 1.5% milk fat). 2) Nestle manufactures UHT milk in the form of Nestle Slim Milk which has a fat content of less than 0.5% which can be consumed without boiling. 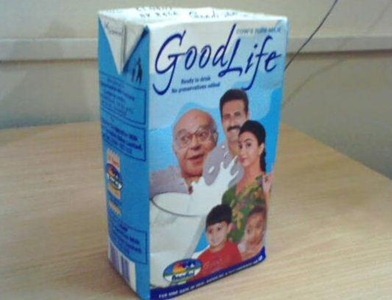 3) Amul manufactured its UHT milk product in form of Amul Lite with virtually zero fat content, nil cholesterol and 8.7% SNF minimum, in convenient packs of 1 liter, 500ml and 200ml packs. Do you feel that UHT milk will be the way forward amongst young couples and other people with high-end consumer demand for sophisticated food products? MILK is a deadly poison. Each sip contains growth hormones, fat, cholesterol, allergenic proteins, blood, pus, antibiotic, bacteria and virus. Hitesh. . . did you just say pus? And do you mean what you said? Generally Milk is called the Complete Diet for people of any age group. a well pasteurized milk is always healthy, and i believe the UHT milk is well pasteurized and fat free.